Five days after leaving Earth, China's second lunar mission slipped into a preliminary orbit around the moon early Wednesday, setting the stage for at least six months of scientific observations. The unmanned Chang'e 2 orbiter fired its propulsion system for about a half-hour beginning at 0306 GMT Wednesday (11:06 p.m. EDT Tuesday), according to China's state-owned Xinhua news agency. The burn allowed the moon's gravity to capture Chang'e 2 in an elliptical orbit about 12 hours long. Two more braking maneuvers are planned to place the spacecraft in an operational orbit 100 kilometers, or about 60 miles, above the moon. Chinese media reports say Chang'e 2 will eventually approach within 15 kilometers, or 9 miles, from the lunar surface. Chang'e 2 blasted off from the Xichang launching base at about 1100 GMT (7 a.m. EDT) Friday on a Long March 3C rocket, which propelled the 5,500-pound satellite into an Earth orbit reaching as far as the moon. Friday was National Day in China, marking the 61st anniversary of Communist rule there. The 112-hour transit from the Earth to the moon was less than half the time it took Chang'e 1 to reach lunar orbit in 2007. China's pioneer moon orbiter made the trip in about 12 days. Chang'e 2 launched on the more powerful Long March 3C rocket, which includes a pair of liquid-fueled boosters for extra energy leaving Earth. The Long March 3C injected the spacecraft into a higher orbit, meaning Chang'e 2 burned less fuel during the journey to the moon. The extra fuel left in the probe's tanks mean it can continue operating well beyond its baseline mission of six months. Chang'e 2 was built as a ground spare for Chang'e 1, in case the first mission failed. Xinhua reports Chang'e 2's peak imaging resolution will be 10 meters, or 32.9 feet. Chang'e 1's cameras could resolve objects 400 feet across. Chang'e 2's lower orbit around the moon will also contribute to the sharper imagery. Officials named the Chang'e lunar program after the Chinese goddess of the moon. Chang'e 2 will map candidate landing sites for the next mission in China's lunar program, which targets a robotic touchdown on the moon after launch in 2013. Another project in China's long-term plans is a vehicle to return soil and rock from the moon back to Earth. 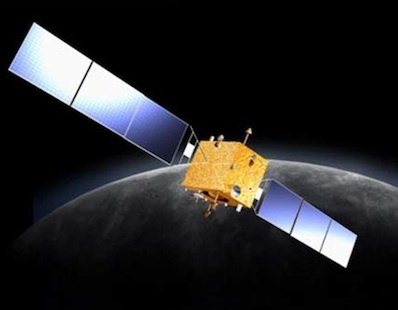 After its $134 million baseline mission at the moon is finished, Xinhua reports Chang'e 2 could enter an extended phase. Officials are considering three scenarios for Chang'e 2's overtime, including sending the spacecraft away from the moon and into deep space, giving Chinese engineers practice in operations further from Earth. The satellite's propellant could also return Chang'e 2 to Earth orbit, according to Huang Jiangchuan, a chief designer quoted in Xinhua. Chang'e 2 could also continue circling the moon, relaying more science data before attempting a landing or impact on the surface, officials said. Chang'e 1 was deliberately crashed into the moon at the end of its mission in March 2009.